I’m pretty sure the science shows we all have a default setting that we learn by doing and teach by example. We crave direct experience that puts us into meaningful contact with each other and makes us more aware of our own insights. When we learn we teach ourselves. When we are caught in the act of learning by others we are teaching. For years I didn’t know there was a word for someone who teaches herself. The word is “autodidact” and means a self-taught person. Years ago I went to see the painter Frank Lobdell near the end of his teaching career at Stanford University in Palo Alto, California. We had never met before and the only time we had spoken was over the phone to set up the meeting. I saw an exhibit of his work at the San Francisco Museum of Modern Art and his paintings struck a cord with me. I was looking for direction so I thought I’d ask someone who’s work I admired. When I got there I showed him some of my artwork and discussed my methods. He listened carefully. When I was done there was only silence – the two of us looking at each other as if he was listening to what I didn’t say or couldn’t find the words for. Finally he said, “I don’t know what to tell you but let me show you something.” He turned around and pulled a college-ruled spiral notebook off a shelf stuffed with college-ruled spiral notebooks. He leaned forward and opened it up so I could see inside. It was full of doodles made with a black ink ball point pen. He said, “Try doodling and train your eye to follow your hand. See what comes out and build on that.” That was it. And this is one of the critical methods Rebecca and I use whenever we have the opportunity to work with others who have kept their creative lives buried – doodle, see what comes out, build on that. 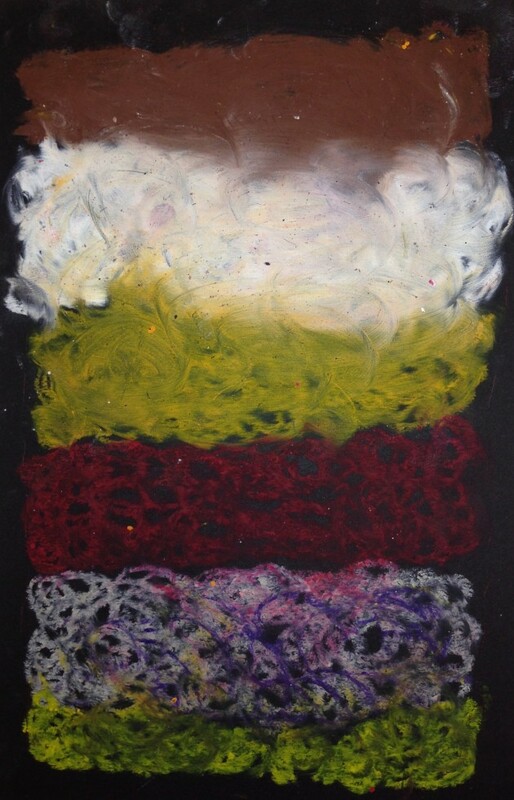 The work above was created by a young Theater of Inclusion artist using this method working with oil pastels on black paper. If you look carefully at the image you can see the artist teaching herself.